Subscription boxes have become really popular. They make lovely gifts which give year-round pleasure; children love to receive their very own post. We've also included other home delivery products that are not on a subscription basis, as well as magazines. Little Box of Books is a new monthly subscription service which focuses on bringing the very best of inclusive children’s books to your home. They want all children to be able to relate to the characters and situations they see in the books as they read and learn about the lives of others. So you can expect a carefully selected selection of books with strong storylines and good illustrations; stories that children will enjoy over and over again (and adults will be happy to read over and over again!). Multicultural and diverse characters will play a strong role and characters incidental to the storyline will show the world in all its multicultural and diverse brilliance. Gender equality will feature as will all sorts of family situations along with greater visibility for under-represented children. These are excellent aims and the pack we received certainly lives up to them. Our pack was for 0 - 3 year olds and the first thing that struck me was the beautiful wrapping of the books - a real treat for children. I love to encourage the giving of subscription boxes as an on-going gift and the wrapped books are perfect for this. The first book was Clive is a Nurse which uses a role-play scenario to show Clive looking after a diverse range of toys, encouraging empathy as well as modelling play ideas. The second book was Wheels at Work: Construction, where children can lift the flaps to see a range of vehicles at work being driven by a cross-section of people. Lastly was The Drum, a vibrantly illustrated multi-ethnic story that encourages children to move and play along with the beat of the drum. It's a good variety of books and an activity sheet is included for The Drum and Construction to increase the value of the books. There's also an A4 reading record so children can keep track of their reading. The pack included a colourful pair of maracas, ideal for playing along with The Drum, and wax colouring crayons. The inclusive nature of the books is what sets Little Box of Books apart and it is an important issue in our modern society - there are some interesting points made on the Little Box of Books website. It's a varied selection of books and just right for the age group; the additional gifts make even more fun for children and I know they will be excited to look forward to receiving one of these boxes every month. There are three subscriptions to choose from 0 to 3, 4 - 7 and 8 - 11 (coming soon). Each includes up to 4 beautifully wrapped brand-new titles plus puzzles and activities; a reading record and progress stickers; a free gift and learning guides and lots more to help children make the most out of their reading experience. The costs from £18 a month (March 2019). For every monthly box of books you buy, Little Box of Books will donate an additional book to their charity partner, Doorstep Library. Choose your subscription here. See our exclusive special offer below. We received two boxes from Lucky Gecko and were impressed as soon as we opened them. They offer two options, each with a range of topics. The first we explored was the Sleuth Bumper Pack, perfect for aspiring detectives and all children who are keen to understand the world around them and are always asking questions. The pack is inspired by detectives and code crackers and will encourage children to think logically to solve problems. With Alan Turing recently voted the most iconic person of the 20th century, here's the chance for children to follow in his footsteps and explore codes and ciphers. The task is to identify the culprit in a fictional criminal investigation. The activities will help with the code work which often tested in the 11+ and Common Entrance exams, but have huge benefits for every child. The set includes a Sleuth booklet with activities, challenges and competitions; Intruder Alarm kit; which shows the science of circuits MadLibs vocabulary game with all the puzzles related to the theme; Invisible Ink pens; Morse Code kit to make secret messages; a reading book related to the theme (ours was Knightley and Son by Rohan Gavin), 3 Where's Wally postcards; good luck charm (ours was a Tintin figure) and a themed bookmark and badge. A parent pack is emailed at the same time, which explains all the academic benefits of the items and activities. It's all attractively presented in a sturdy cardboard box which can be used to store all the components together. The mixture of products enclosed is excellent, covering a wide range of activities and it represents good value for money - £35.95 February 2019. Each large box is also available as three smaller packs, each containing a booklet which is tailored to a particular learning style, as well as one key educational item related to the theme. It's really good to be able to choose in this way. We were sent the Curiosity Ornithology Pack which contains: Curiosity booklet; flying ornithopter model; origami paper and exclusive, themed badge. There is also a parent pack email with this. Again, it's a good balance of activities and the booklet is full of activities as well as suggestions on using the pack content. The packs really do help children understand the concepts and inspire them to explore and discover; there are activities they can enjoy on their own and also some to share with parents, which is a good balance. They are good value at £13.95. Also available are packs themed on Kids Rule which are designed to get your child feeling really good about themselves! Find out more on the Lucky Gecko website and choose your box(es) here. Don't forget to check back too, as they promise new boxes are on the way. Lucky Gecko have generously offered a 15% discount code for our readers. Just enter the code PARENTS at checkout. Valid until 31 January 2020. Lucky Gecko say: "Learning should be an adventure which will last a lifetime. It is what makes the world exciting. The more we know, the more we want to know. The more we search, the more mysteries we find. We believe that we need to inspire the next generation to think differently about their education and take back control of how they learn. Lucky Gecko Discoveries want to get children connecting the dots between what they learn at school and the world around them. Knowledge doesn’t (and shouldn’t) break down into simple, separate chunks that we can choose to like or not, be good at or not. Geography is History, History is Literature, Music is Maths and Sport is Science. Everything connects, and finding those connections is both inspiring and empowering. Our boxes will teach children about the world, about themselves and about others. But they will also give them the confidence to be curious, to dream and to think for themselves." We love these boxes and they fulfil those aims excellently. The best thing we can do for our children is to inspire them to love learning and these boxes are a superb way to do that. I am passionate about encouraging children to get outside and enjoy nature, so I was thrilled to be sent the January totbox. 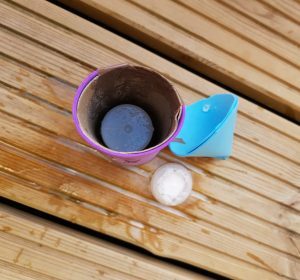 From packaging to contents, it's all completely natural and all the activities are designed to encourage children outdoors; but whatever the weather, there's an indoor element to them as well. Each Totbag includes a mini branded activity bag and everything needed for 3 outdoor activities, suitable for children of 3+. There's also an informative nature journal packed with guides on how to complete the activities, information as well as additional fun and games, all nature-themed. All the materials are environmentally friendly. The bag is designed to be taken with you whenever you and your child go outside, to encourage collection of natural items, whether related to the activities or not - Totbag reminds us to respect the natural world when collecting these items. Our box included all your child needs to make a winter wonderland, to be home to the owl created from a pine cone, as well as a mould and seed to make a bird feeder. The winter wonderland needs you and your child to go out and collect various decorative items, so use this as a spotting and identification opportunity. Once you put the birdfeeder out, there will be birds to observe and recognise. The instructions are clear and easy to follow and it's clear to see the passion that goes into these boxes, to encourage children to take an interest in nature; it's a good support for the KS2 science curriculum too. It's all packed in a letter-box friendly cardboard box. There are lots of different purchase options meaning there is something for every budget, and offering excellent value. You can purchase a one-off seasonal totbag (£14.95 + P&P ) or an individual Totbox (£5.95 + P&P) subscribe on a monthly basis, 6 Monthly or 12 Monthly Totbox £34.75-£76.45 with your first month free. Visit their website here. Prices correct February 2019. A lovely way to encourage an on-going interest in nature, with the enjoyment of a monthly box when you take out a subscription, encouraging awareness of the cycle of the seasons. We were very kindly sent four Kiwi Crates to review; one for each of the children. The Kiwi Crates are designed for ages 0+ and I've not come across subscription boxes for such specific age ranges before, so I was really excited to see what was inside! 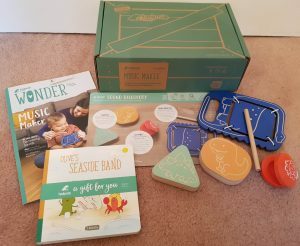 Inside the box you get: a wooden dinosaur shaker, a triangular dinosaur shaker, wooden castanets with a lion on them, a wooden Guiro drum, a book called 'Olive's Seaside Band', a booklet and a 'how to' sheet. Just from opening the box and having a quick look, it is clear to see the high quality of the contents of the box. The instruments are so well made, with great attention to detail, and we love having a book included as children are never too young to look at books. The booklet included is a comprehensive guide on how to make the most of your music maker; it covers helping your child to discover new sounds, how music helps your little one grow, why rhyming is an important skill, along with other activities to try at home. The activity sheet shows you the developmental skills that the set helps with, in this set it is: cognitive development, sensory play, gross motor skills and hand-eye coordination. Such a fantastic crate for babies, and you can add the instruments to their toy collection so they can get them out to play with whenever they want. Inside the box you get: a wooden ramp with a felt piece attached underneath, one large felt piece with puzzle notches in the ends, three small felt puzzle style pieces which are decorated with felt grass, a wooden ball with a mouse face on, a book called 'Olive Wants to Slide', a booklet and an activity sheet. As this crate is aimed at slightly older children, they have an activity that they can do/make.. The pieces of path all need to be joined together, starting with the ramp and ending with the home for the mouse. Your child will work out that after playing with it for a while that they can make more than one path with the pieces. Just as the previous box, the parts are all of excellent quality, with a real eye for detail. The enclosed booklet covers the 'Developmental Focus Area', 'Your Growing Child', 'Literacy and Language' and 'Beyond the Crate'. The activity sheet gives you the developmental skills the activity focuses on, which in this crate is: early science skills, cause and effect and observation. The difference between this crate and the one for 0+ is so well thought out, toddlers love being able to do things themselves so it is great for them to work this out for themselves. In the box you get: lots of different pieces to make an arcade grabber game, including wooden pieces, screws, nuts and bolts, string, rubber bands and yarn for making the pom-pom toys you catch with the claw. The activity is to make an arcade style grabbing claw and pom-pom prizes for it to pick up. The booklet first shows you how the claw works before moving on to the instructions which show you how to make it; the instructions are very well described and illustrated, as the number of parts included could look a little daunting for a younger child, but my mini reviewer is only just 6 and she was able to follow the instructions with a little help from an adult. The finished claw is very sturdy and easy to use, the pom-poms were also fun to make and inside the included magazine you can expand on this activity by using your Kiwi crate to make a box for the game. In the Explore magazine there is a cartoon, story, drawing and several pages of arcade related activities, which gives plenty to keep your child entertained for weeks. 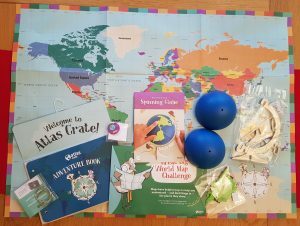 Inside the box you get: a large world map, globe halves, felt stickers, wood pieces, activity sheets inside an envelope and instructions. 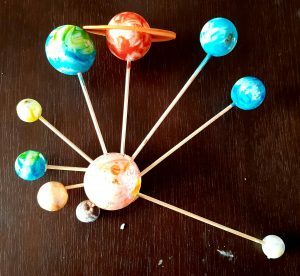 First of all you make a spinning globe by following the instructions; my mini reviewer is 7 and he was able to do this without any help from me. 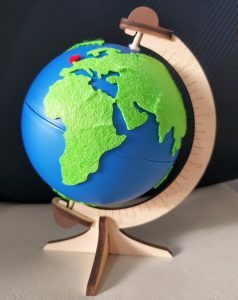 The end result is a brilliant mini spinning globe on a wooden stand, and just like the parts in the other boxes, it is really sturdy and made from high quality parts. The Great Big World Map Challenge sheet shows your child how to use your map to find things and teaches basic map skills by showing them how to use longitude and latitude to locate places. The Adventure Book is a collection of cards which contain activities, world facts and even a recipe and are held together with silver rings so you can add to them with further boxes. My mini reviewer loved the combination of making something and learning something at the same time, as this box has great educational value. From the selection of boxes we were sent, the consistency in the quality of all the contents and projects was outstanding. Each box has been so well thought through and so perfectly matched to the ages and abilities that the crates are aimed at. The accompanying booklets in the crates for babies and toddlers are aimed at parents and give ideas and suggestions on helping further development, whereas the booklets and magazines in the crates for older children are very much written with the child in mind. The projects have a huge focus on education and STEM/STEAM learning and are innovative and inspiring. The projects are definitely things you will keep and use again and everything you need is included in the box which means you can get stuck in straight away rather than spending time searching for things. Children will learn so much from each crate, and they would also be great for home educators. The Kiwi Co Crates come in many different ranges Tadpole (0-2), Koala (3-4), Kiwi (5-8), Atlas (6-11), Doodle (14+), Tinker (9-16), Eureka (14-104). The crates can be purchased on a monthly, 3 monthly, 6 monthly or 12 monthly subscription, most crates are around £15.78 a month but this does depend on which crate and the length of the subscription. You can change the type of box you receive at any time and the boxes are shipped monthly. Head over to KiwiCo to see what crate suits your child. KiwiCo have kindly offered Parents in Touch followers an offer of a free one month subscription (excluding p&p) - Sign up for your free month here. I love the concept of OKIDO magazine, and the fact it is intended for children as young as three - the suggested age range is 3 to 7. It's relatively easy to find high-quality science resources for KS and KS2 children but OKIDO is brilliant because it taps into the natural curiosity of younger children, as well as continuing to extend that curiosity as they get older. We were sent two magazines to review. The first, issue 65, is all about coding and includes stories, experiments, games, doodles, a recipe and a poem; there's even a secret code machine. The mix of activities works well and really help children to grasp this complex but essential subject. Our second issue, 66, is Heart and Blood and the special activity in this is making a body puppet. Visually, the magazines are attractive and engaging, with plenty of bright pictures, helpful diagrams, good use of fonts and clear directions with a purpose to every activity. Cycling, dinosaurs, colours, music, transport and ice - just a few of the many subjects covered in the magazine (back numbers can be bought from the OKIDO website). The focus on just one concept is perfect for young children and works far better for them than jumping around from one subject to another. The range of articles and activities is so wide-ranging that there is plenty to engage children's attention and give them a really good grounding in the topic - and to make it interesting for them so they are keen to learn more. OKIDO’s philosophy is a simple one: every child is a creative scientist; the OKIDO world immerses young children in a spectrum of playful activities and media, all intelligently designed by science and education experts. There is plenty to enjoy on their website, which extends on the activities available through the magazines. Messy goes to OKIDO is a popular CBeebies programme in which Messy, a monster, explores science questions that children ask about the world around them. At the heart of it all lies STEAM learning (that’s science, technology, engineering, the arts and mathematics). Everything in the OKIDO world is designed by science and education experts to encourage collaboration, curiosity, exploration, discovery, creativity and critical thinking. This is so apparent both through the magazines and on the website; its founders, scientist Dr Sophie Dauvois (PhD BSc PG Dip.) and artist Rachel Ortas, are still every bit as passionate about engaging young kids in the scientific world around them using play, art and fun. This passion really does shine through and children respond really well to the enthusiasm and to the wide-ranging activities. OKIDO is available with a range of subscription options: from £30.00 every 6 months. £30.00 every 6 months. Each issue is 48 pages jam-packed with stories, regular characters, doodles, poems, games, experiments, a pull-out centrefold activity and a recipe that the family can make together – keeping children engaged for hours with things they can do on their own as well as with a grown up. I love the concept of something children can look forward to on a regular basis; it really generates enthusiasm. It's a perfect gift that children will enjoy year-round, long after many are consigned to the back of the cupboard. Highly recommended. A Banjo Robinson subscription supplies 4-8 year olds with personalised letters from Banjo Robinson, a magical globetrotting cat, to boost reading and writing skills and to encourage learning about geography. Letter writing is definitely a dying art, so it's really great to see a way to encourage children to write letters - and they will love to receive their regular personalised letters. Developed with teachers and inspired by Montessori learning, Banjo’s letters are aimed at encouraging children to write a reply - and then to 'post' it under the sofa! One a fortnight, your child will receive a letter is sent from a different country, containing stickers, country stamps, writing stationery, a mini reply envelope, and a colouring-in activity. Banjo’s first letter also includes a beautiful world map poster for children to decorate with their country stamps, thereby learning lots about world geography - this is an excellent part of the packs. Children will learn about different countries and cultures as they read about Banjo's adventures around the world. The packs are very much designed for parents to use alongside their child to gain the full benefit, as they read Banjo’s letters, help them to write a reply, and then hopefully spend some time finding out more about the country Banjo has visited, widening the child’s vocabulary and building communication skills. The letters, which are written in a very friendly style, are posted to the subscriber’s home twice a month and usually arrive on Saturday mornings. Children are encouraged to post their replies to Banjo under the sofa before bed, and to check again in the morning to see if they have been collected by one of Banjo’s cat friends overnight. Parents are able to add their own closing paragraph to the next letter that Banjo sends, referencing their child’s reply, in order to create an authentic back-and-forth ‘penpal’ relationship between child and cat. The subscription starts at just £5.15 per month, and you can choose from 6, 12 or 24 destinations. The personalisation is what sets this subscription apart and children will love this aspect as they marvel over the fact that Banjo knows them so well. Subscribe now at https://www.banjorobinson.com/. 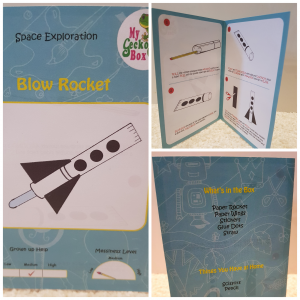 Space enthusiasts age 3 to 6 will be over the moon with this superb selection of books and activities, all themed around space - see below for sample spreads. Key to the pack is Wonderkid's own excellently illustrated A4 booklet all about space. It introduces the planets and has a quiz to be enjoyed. There's also an activity based on The Way Back Home - and children can submit their pictures and stories to the Wonderkids website - a good incentive for them. Our pack includes four books; two picture books and two non-fiction. The picture books include The Way Back Home by Oliver Jeffers, which is the story of a little boy who found himself stuck on the moon... and not alone. It's a lovely story of friendship, beautifully illustrated. The second picture book is On the Moon by Anna Milbourne and Benji Davies, which is a clever blend of fact and story about a journey to the moon. An Usborne Lift-the-Flap book Look Inside Space by Rob Lloyd Jones has over 70 flaps to explore as children learn about rockets, the moon, a space station, stars and galaxies, and find the answers to questions about space. The final book is the Usborne First Sticker Book: Space. Children love sticker books and there's plenty to keep them engaged as they find the right stickers and learn plenty of facts at the same time. It's a well-rounded selection of books, perfectly selected for the age group. There's a real fun element (that also shows the reality of life in space!) which is a pack of freeze-dried ready-to-eat Neapolitan Ice cream. This is such a great inclusion - it's unusual and unexpected and proved a real talking point and lead-in to discussing life in space. Finally, the pack included a Space Snap Game which is a lovely colourful version of the classic game which will also help identification as the pictures are all labelled. The pack is really well designed, with plenty to keep children occupied and all very age-appropriate. It's also good value when you consider how much is included. See below for how to subscribe to Wonderkid. This is a superb pack for space enthusiasts age 7 to 12 and the wide range of books included really covers the subject comprehensively. Unlike the pack for younger children, the books are all non-fiction. The quarterly magazine included is themed 'Let's Explore the Solar System' and introduces all the planets, along with their moons, plus asteroids and comets. There are also articles about Galileo and Newton and their discoveries, as well as a quiz. A pack of Usborne Spotter's Cards 100 Things to Spot in the Night Sky offers plenty of encouragement to go outside and marvel at the wonders of space, with illustrations of the constellations plus information cards; these cards are all packed with information succinctly and usefully presented. Children will relish the novelty of the two iExplore books (iSolar System and Into Deep Space), which include stunning augmented reality experiences accessed through the free app. They will be fascinated to learn about life in space in the Usborne Official Astronaut's Handbook which really takes a good look at the life of an astronaut. 100 Things to Know About Space is actually for more than 100 as there are 100 pages each answering plenty of questions. Readers at the younger end of the spectrum will enjoy the Lift-the-Flap Questions and Answers About Space. There's also a book (a US publication) about Isaac Newton, rounding out a varied selection of books. Finally - and children will love this - there's a Moon Torch which projects a clear image of the moon when used in a darkened room. The only duplication with the Junior pack is the pack of freeze-dried ready-to-eat Neapolitan Ice cream, but that was fine as we have two home-educated children and the food provided a great snack when learning about space. 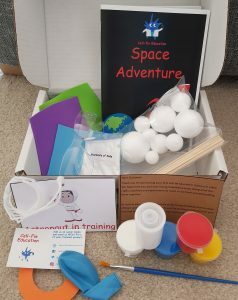 This is such a great inclusion - it's unusual and unexpected and proved a real talking point and lead-in to discussing life in space This massive pack costs is £70.37 and offers many, many entertaining and educational hours of reading and activities. Wonderkid and Wonderkid Junior are available as quarterly subscriptions. Wonderkid is £43.65 a quarter or £168.35 for a year and Wonderkid Junior is £34.74 a quarter; and £134.72 for a year (prices correct December 2018). Sign up here for your subscription. You can also buy past editions from the website which is excellent if you (or your child) spot a particular topic of interest. Other bumper packs include Robots and Ancient Greece; Wonderkids editions include Dinosaur, and Insects, Bugs and Creepy Crawlies; Wonderkids Junior include Dinosaur and Ancient Greece (there's no overlap between the books and games included in the Wonderkids and Wonderkids Junior editions). The booklets that accompany the packs add real value and are very well produced with careful attention being given to making them age-appropriate. It would be good if they included some hands-on activities though, maybe a craft or an experiment to support the topic. Overall, though, these packs are quite exceptional and the three-monthly subscription gives children plenty of time to get to grips with one topic before moving on. Highly recommended for inquisitive children and to encourage learning and generate a sense of wonder. Kent & Fraser - Olive, Walnut & Pimenton Toast 110g. These are crisp and tasty, with lots more flavour than most similar products. Perry Court Farm - Sweet Apple Crisps 20g, A flavoursome healthy snack. Yorkshire Popcorn - Salt & Sweet Popcorn 40g Perfect for film-watching, tasty and not too unhealthy! Hawkshead Relish - Raspberry and Vanilla Jam 227g. One word - scrummy! Miller's Elements - Smoked Flour and Red Hot Chilli Crackers 100g. These really pack a punch and set cheese off superbly. The Real Smoked Nut Company - Hickory Smoked Almonds and Cashews 100g Have these with the popcorn for the ultimate enjoyable TV snacks. The gourmet produce is carefully presented in a bespoke lidded British icon gift box (featuring iconic British institutions) which is hand tied in ribbon and delivered with a personalised gift card. I'm really impressed by the range of speciality hampers available, which includes gluten free, diabetic and vegan - this is excellent for those who follow specific diets, with no need to worry about checking each individual item. Hampers are a great way to try out new foods, and you're bound to find on the Yumbles website some to-be new favourites that perhaps are not generally available in your locality. The products are sourced from all over the UK and there are some superb producers included; it's great to see their products brought to a wider market and that's a real feature of these excellent hampers. They are perfect gifts - or just treat yourself, as it's such a pleasure to have an attractive box of top quality food arrive on the doorstep. This hamper costs £35.95; free delivery is available with a minimum spend and there are plenty of delivery options available to suit everyone. I was amazed at the huge range and variety available; there really is something to appeal to everyone. Explore a range of vegan hampers at Yumbles. A little bit of extra themed fun to help keep little cooks entertained! A spooky window sticker. Just £8.99 per month including postage (get your 1st box for just £6.99 using code BOX1 at checkout) 3 month subscription just £25.99 6 month subscription just £50.99 12 month subscription just £100.99 (all reduced with pre-payment). Cooking together is perfect for family time, and it offers so many learning opportunities too, including healthy nutrition, weighing and measuring, and creativity. Head over to the Little Cooks website to find out more. First News is the UK’s only newspaper for young people, it was founded in 2006 and it creates fresh and innovative news content that speaks directly to young people. This review is based on two copies of First News that we received for review so some features may not be included in other issues. The newspaper is aimed at 7 – 14 year olds and covers topics that an adult newspaper would, such as news, sport, entertainment, interviews, puzzles and competitions. There is a ‘quick news’ section inside the front cover which is 20 short news items that you can read quickly yourself and then share with your friends. I really love these bite-size chunks of information as many of them were things that I cannot imagine my child knowing anything about before he read them! First News covers serious news topics, in this issue there was an article on Syria and the problems there. I thought this was another great feature as I think it is important that children aren’t sheltered from world events when they aren’t very nice, the newspaper explains things in a simple and easily understandable way which doesn’t sound as dramatic or scary as it might on the radio or on television. The newspaper is laid out much like a traditional newspaper but with brighter and more eye catching articles. The text is kept short or broken up in to boxes which will keep your child’s concentration but there is also a huge amount of information packed in to those small spaces so it continues to be interesting to read. There is animal news, science news, an interview with a footballer, a ‘what’s on’ guide for summer festivals, a traditional cartoon strip, fun facts, coverage of charity events as well as puzzles, competitions, book reviews and much, much more! There are only a few adverts through the paper which are all child-friendly and relevant to the content e.g. books, theatre workshops and educational subscription boxes. First News is the UK’s widest-read publication for children and I can really see why, I have enjoyed reading them all the way through and you never get bored as there is such a variety of subjects to read about. I think that if I was a child reading First News then I would feel that it was really aimed at me, it is suitable for a wide age range (7-14) yet each article and feature seems to fit across the age range perfectly. I have found that there is so much to talk about with my child on every page, my mini reviewer is 7.5 and he has absolutely loved reading them. I will definitely be subscribing to these for him as it is a great way for him to learn all about world events, news from the UK and loads of other fascinating facts, features and fun stuff. First News is published weekly and costs just £19.99 for 3 months, this works out at £1.54 per issue which is an absolutely brilliant price for the amount of content, not to mention much cheaper than some of the magazines aimed at kids. If you subscribe now you can get 6 issues for £0! Subscribe here! The first thing I noticed when I opened the box up was the incredible amount of materials and equipment that is included in this box! 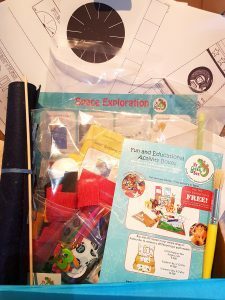 We received the Space Exploration Discovery box to review and it has four craft activities inside for your child to do. The materials for each activity are separated in to their own bags and there is a booklet in each bag with instructions. There is also a handy guide on the front which tells you how much grown up help is needed (low, medium or high) as well as a messiness meter. Three of the activities require medium help and one needs a high amount of help; two of the activities are of medium messiness, and two are low messiness. Inside are detailed, step by step, illustrated instructions and on the back of the booklet it tells you what materials you will find in the bags and what items you will need from home, but this is only either scissors or a pencil. Everything you need is there and it is explained clearly, but I also noticed that all the little details are also done for you (holes in the material ready for the stick to go through to hang it and the lines for the planet orbit are pre-marked for you to go over in chalk). 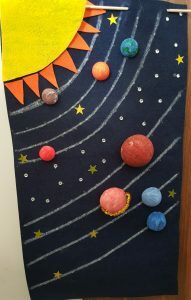 The end result is a fantastic looking solar system chart which is perfect for hanging in your child's room. 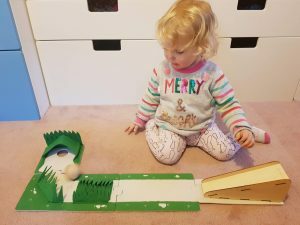 My mini reviewer really loved this, it was so simple to make, and again all the little things have been thought about - there is even a wooden peg included which you can use to hold the tube while you paint it so you don't get any paint on your hands! This activity was also an experiment to find out whether your rocket went further with 2 wings or 4 wings. We discovered that our rocket went further when it had 4 wings! This activity had my mini reviewer crafting away for ages. The bag of bits for decorating this was amazing so once it was finished it looked amazing. The box contains a sheet full of space facts which are presented in a fun way which helps to capture your child's attention. They will also enjoy the 'funny fact' which in this case we learnt that astronauts have to wear a seatbelt on the toilet when they are in space so that they don't float away! My Gecko Box is 'full of STEAM focused crafts from measurements and fine motor skills to imaginary play. Each craft is designed to inspire children to discover more and we believe children learn more when they're having fun'. The Space Exploration sheet has an extra fun task in which you can use a pack of Oreo biscuits to find out about the moon phases by following the diagrams. 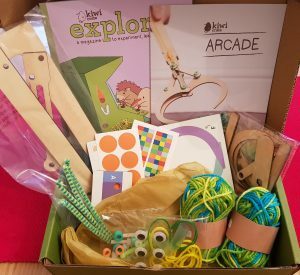 The materials that come with the box are good quality and there is a fabulous amount of them included, the instructions are well written and easy to follow and this box has provided hours of fun, but there has also been a great deal of learning done too! Everything in the box is well presented and my mini reviewers thoroughly enjoyed all the crafts included. My Gecko Box is aimed at children between the ages of 3 to 10. There are 3 sizes of box to choose from (Little Explorer - £5.95 per fortnight, Explorer - £10.95 per month or Discovery - £19.95 per month) and there is a sibling offer available too. 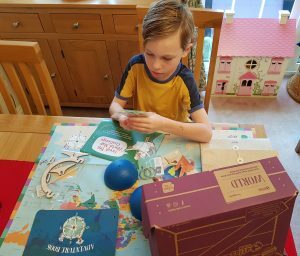 We have reviewed the Discovery Box in which you get between 4-5 crafts to get stuck in to, Head over to My Gecko Box to subscribe. Parents in Touch have been offered a discount for our readers, enter code PIT50 to receive 50% off the three month summer series for July, August and September - Use it here. Watch out for our July giveaways so you can be in for a chance of winning an Explorer Box! 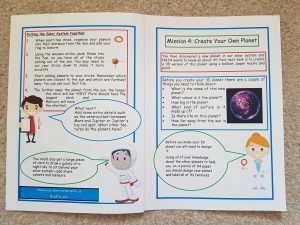 The included booklet introduces you to Alfie the Astronaut who tells you to fill in your astronaut ID badge so that you can get started on your missions. On the opposite page you will find 5 missions. This encourages your child to learn a little about the subject of the box, rather than just jumping straight in to experiments or activities. Create a poster or booklet to display your findings. 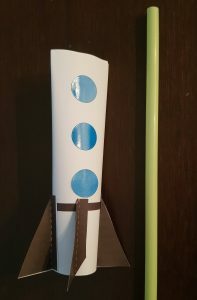 Follow the instructions using the included materials to make the rocket and then you can try launching it after adding vinegar and bicarbonate of soda to the canister. 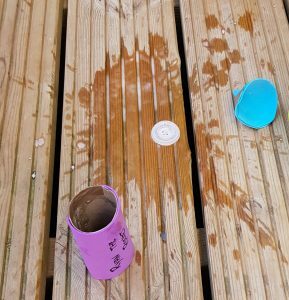 The rocket will launch itself up in to the air, we tried this with the canister included; the first time we didn't have a chance to get the canister back in the rocket before it exploded, but the second time it went so high we lost the canister! You can try this experiment using different sizes of bottles and you can also alter the measurements of vinegar and bicarbonate of soda to see if this makes a difference. The page also explains the science behind the experiment, detailing the chemical reaction and what makes the rocket shoot up in to the air. Again, all the parts you need in order to make this are included in the box. To start with, the balls need to be sorted in to sizes so that the solar system planets are in the right order. I really like that your child has to sort them out themselves in to size order, and then follow then instructions so that they are in the right order. Next you can paint your planets and you can use the information that you found out in your first mission to paint them in the colours you think they would be. Once the planets are dry the ring can be added to Saturn and then start pushing the sticks in to the sun (some sticks may need cutting down). The shortest stick should then have the planet closest to the sun attached to it, and the longest stick should have the planet furthest from the sun stuck on the end. The instructions teach you how to make a papier mache mix that you will then cover your balloon with. You can add more layers to create different textures and landscapes and once it is dry it can be painted however you like! Children have great imaginations and it is wonderful that this science box is also supporting English, along with maths and art all in one place. There are story suggestions to help your child with their writing too. We were really impressed with this box and my mini astronaut enjoyed taking part in all the missions. His favourite was the rocket experiment and he found out that if he added less bicarbonate of soda then it took longer to explode. The box comes with all the kit that you need to do the experiments which is always a great feature and we love how educational the kits are. Children learn better when they are having fun as what they are doing sticks in their head and this 'Lesson in a Box' is a great way of helping them explore their curiosity. The monthly subscription box costs just £10.95 and you can subscribe here. The aim of Mud & Bloom is to inspire children to connect with the outdoors, and receiving regular monthly boxes through the post is an excellent way to achieve this. The boxes are designed for 3-8 year olds - the perfect age range, when children are inquisitive about the outside world, and keen to learn through hands-on experiences. Each box includes everything necessary for two appropriately seasonal activities - one gardening and one nature craft. Clear instructions are included as well as quizzes and games. Activities have been created by qualified teachers with influence from Forest School, Steiner and Montessori education; they support the national curriculum . We received the May themed box - I really like the fact the contents are totally relevant to the month. The box contained five factsheets which explained how to sow and grow the seeds, how to make the crown and mask, information about what happens in nature in May, how to make a nature loom, and minibeast quizzes. There are sweet pea and pumpkin seeds to sow plus all the pieces needed to make a crown and mask. Over the months, children will learn about the seasons, plants, insects, birds, soil and rainfall. Don't worry - you don't need a garden - you will find all the seeds and materials needed for the gardening activity - there's no need for you to have a garden or tools (our May pack included compost blocks in which to sow our seeds). Nature craft activities are designed around things that can easily be found in parks and gardens. This is a lovely box for children to receive; so often, activities focus on being indoors, so it's brilliant to see ideas and inspiration for discovering the wonderful world that is to be explored outside our homes. The activities are well thought out and ideal for the age group, with plenty of opportunities for parents to share the excitement with their children. A subscription to Mud & Bloom will make a lovely year round gift, and children will eagerly anticipate the monthly arrival of their box. A box costs £7.95 a month inclusive of shipping if you're based in the UK. You can skip a month or cancel at any time. 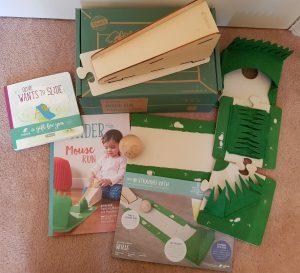 Mud & Bloom now offer a sibling box, which includes enough materials for two children to do all the activities and it costs £11.95 a box. Subscribe here. 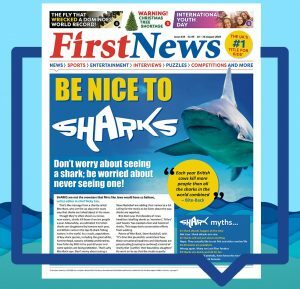 First News is a highly successful newspaper for children which has proved a huge hit with schools as well as families. Now the team behind this has brought out First Wonder Box - a brand new subscription service. Combining learning and fun, First Wonder Boxes are designed for 4-8 year olds. The aim is to introduce them to the world around them, topics so far include Castles, Under Sea and Human body. Each is full of fun activities that will help children learn, and they support the Early Years and KS1 curriculum too and education experts have been involved. The varied activities may include word searches, crazy facts and quizzes; drawing challenges, games, stickers, collectable cards, puzzles and creative projects; there will be a themed toy too and even the box transforms into a game or activity. The wide range of activities is great for involving children and for offering something that appeals to everyone. The boxes develop so many of the key skills, including creativity, problem solving and hand-eye coordination. Boxes cost £7.99 each and are delivered fortnightly; subscribers can pause or cancel their subscription easily, without fear of missing a box. Go to https://www.firstwonderbox.co.uk (valid June 2018) and you will find a special discount offer for your first box. On a practical note, the boxes fit through the letterbox, which is really useful. Children will be really excited to receive each month's box; they make a great gift idea so children have something to look forward to on a regular basis. We were lucky enough to be sent two boxes and our young testers, age 5 and 7, were thoroughly engrossed in the contents. You can see below what we received. The first box was Bugs - perfect for the summer; the second was Castles - again, perfect for summer and days out. The first thing I noted was the bright colourful box - perfect to capture children's attention. The boxes open easily to reveal a plethora of exciting contents. The Bugs box included an activity book, packed with information and things to do, a bee sewing craft kit, a pull-back ladybird racer, a mini magnifying glass, a honey bee pencil, 2 collectable cards, a sheet of bug stickers and a dice. Plus, the box turns into a game. The Castles box was equally impressive, containing an activity book, a build-your-own castle (this is excellent), a themed pencil, a grow-your-own knight, 2 collectable cards, a sheet of castle stickers, a craft stick to make a jester mask, and the collector's album - plus a castle scene on the box. All the contents are well related to the theme and are of good quality. The stimulating contents really will appeal to children and encourage them to investigate and learn more. I think these boxes offer really good value, are excellently compiled and children are going to love them. I know ours did! Mark Making Activity Pack A Happy Little Bundle packed with products and ideas for exploring mark making. Inspired by research demonstrating the importance of mark making activities for building sound foundations for later cognitive development, this pack will promote exploration of mark making with a range of materials. The cost of the pack is £19.50, June 2018. Find out more about the importance of mark making here. "Founded by mum of two, researcher and psychologist Dr Jemma Harris, Happy Little Bundles is a social enterprise working to support the health, wellbeing and development of children and families. We aim to use knowledge and networks within the Higher Education sector to create a conduit between research in areas such as psychology, child development and education and everyday family life. We create family activity packs to support you in spending quality time together boosting aspects of health, wellbeing and learning. Our packs are inspired by research findings from areas such as positive psychology, health, neuroscience and primary and early years education. We utilise profits and grant funding in order to engage in a range of activities that have a positive social impact for families and communities across the United Kingdom. Your purchases help us to make real and practical differences to people's lives. How we do it...read on." See the whole range here. The founders of MEL Chemistry came together because they are science geeks, and they want to share that passion with children. MEL Science have created a standalone educational package that will captivate the interest of your child by demonstrating the real science (real chemistry, not tricks with a scientific slant) in all of its beauty and depth. They offer 38 interactive hands-on chemistry sets plus a complementary app for smartphone or tablet. The sets are designed by experienced scientists and are suitable for children age 9 - 14. Working through the sets will constitute a do-it-at-home year-long chemistry course, which is both fun and engaging, delivered to your home at the rate of two sets per month; it's great for home educators. Your first package will include a free Starter Kit and VR headset. The Starter Kit includes the main chemistry equipment you will need in the experiments. It also includes accessories for your smartphone or tablet to learn chemistry in the best way. It contains - Borosilicate glass beaker and flask; Virtual reality glasses; Macro lens to turn almost any smartphone or tablet into a microscope for capturing amazing pictures and videos of your experiments plus a special stand that fits any smartphone or tablet; Large syringes; Safety glasses and a tray; Solid fuel stove (burner). After that, each month you receive two new exciting chemistry sets on different topics containing from 4 to 6 experiments. Each chemistry set is well planned to include everything you and your children need to conduct 2-3 safe experiments at home. The detailed descriptions that form part of the package really ensure children understand what they are doing and grasp the scientific principles. The sets are complemented by an app will serve as a virtual 3D microscope enabling your child to better visualise what happens in each experiment at the molecular level. More information will be found on the MEL Chemistry site which helps to find out more about the topic of each experiment, as well as answer any questions. The experiments are perfect for parents and children to do together, giving quality family time while engendering a genuine interest in chemistry, and supporting and extending the learning done at school. Following that, children can extend their knowledge independently by using the excellent resources on the website. There is no need to be concerned about safety - the experiments are designed to be as safe as possible - no explosions, no harmful substances. At MEL Science, they don't just create interesting experiments, they make sure that children understand the underlying science - and that's the important thing. This approach will lead to enquiring minds and children developing a real love for the subject. The monthly cost is £38.90 (April 2018) and the subscription can be cancelled at any time. We received the Artificial Sea kit, which allows the creation of chemical seaweed and chemical jellyfish. The products are nicely boxed and it's easy to see what is included; a clear instruction sheet is included for each experiment. They've even thought to include latex gloves. 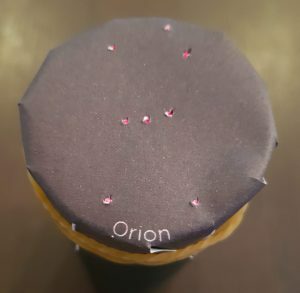 It's totally fascinating to see the product develop in front of your eyes and this really will stimulate wonder and awe, as well as understanding of scientific processes. Our second box is based on tin and includes the kit to make a tin dendrite and a tin hedgehog. Again, all perfectly packaged and easy to see what you get; with some packs, you may need to add basic household items. All the parts are professional quality and will make children feel like real scientists. A brilliant way to excite children about science and one that will have lasting benefits. These two boxes are recommended for 12+. Other boxes include zinc-carbon batteries, nutrients, nitrogen, chemistry for detectives and thermal effects - this gives an indication of the wide range. Hands-on experiments give children confidence in trying out science and I recommend that you encourage children to record their experiments, perhaps with photos, to help with the scientific recording which is a National Curriculum requirement. Impressive quality and a great way to encourage a genuine interest in chemistry; the whole family will look forward to the arrival of the boxes. Subscribe at the MEL Science website. Red Elephant Baby Boxes are subscription boxes filled with some of the best baby products and toys available. You can choose to receive a Premium or Standard box and they can be ordered with a monthly subscription or as a one-off purchase. Once you have chosen which option you want you can also choose either a male, female or neutral box and for how long you would like to receive the boxes for. A cover-all style bib with a bright fire engine design and a handy pouch on the front to catch any spilt food. Four fun bath toys; a seahorse, a fish, a shark and a whale. A pair of decorated wooden maracas. A grey romper suit with lovely soft material and a face design on the front. A spiral toy - great for wrapping round your baby's car seat or buggy. Two dummy clips, each with a different design - one zebra print and one moustache print. An absolutely gorgeous hooded bath robe with a shark design on the hood. A silicone gingerbread man teether. The bath toys and dummy clips each come in their own Red Elephant branded drawstring bags, these can be used again for storage. The teether also comes in its own re-sealable packet. This is a fantastic box full of baby goodies and you would definitely look forward to its arrival each month. These boxes are a great way of getting items that you may not have come across before. This particular box would cost £38 to receive as a one-off, it would be £36 on a 3-month subscription and it decreases to £34 per box on a 12 month plan. 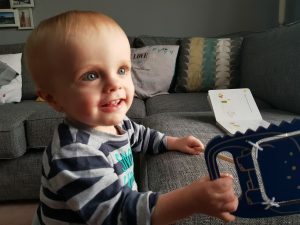 A 12 month subscription ensures that you receive unique hand-picked items from the month your baby arrives, up until they reach 1 year of age. The boxes are fantastic value for the quality and variety of products within them. You can see that a lot of thought has been put in to them and that they have been created by people with children, giving you items that you both want and need. To see the range of boxes on offer visit Red Elephant Baby Boxes, you can also find them on Facebook. Red Elephant Baby Boxes also make one-off toddler boxes along with other items such as changing bags, blankets and sleep sacs. Parrot Street is a monthly book club - your child will receive a letterbox-friendly pack containing a book, an activity pack with games, puzzles, instructions for craft projects and more, plus a booklet with book club-style questions. All the activities and the questions are inspired by the book of the month. It is obvious that a great deal of thought has been put into compiling these, so all the activities are relevant and engaging. Our book was The Incredible Adventure by Dave Lowe. It's Holly's birthday and her explorer dad has planned a special treasure hunt for her. She has ten days to complete ten tasks. THis makes an excellent basis for a story full of interest and variety. It's a great choice for a book club book, as the differing challenges lead into all sorts of ideas for discussion and activities. These really engage children with the book, and will encourage them to think more deeply about all their reading. Parents can choose between two reading levels and the recommended age range is 5 to 11. Parakeets receive chapter books specifically for young readers. Books in this category are typically between 100 and 200 pages in length with plenty of illustrations. Children may be able to read these books by themselves, and they are ideal for enjoying together. For guidance this category is aimed at children aged 5 to 8. Cockatoos are more confident readers, so books in this reading group are typically more than 200 pages in length with fewer illustrations. They may explore more complicated themes. Children will probably be happy to read these books by themselves but there is always enjoyment to be had in reading together. For guidance this category is aimed at children aged 8 to 11. The subscriptions are 3 month subscription £39.95 6 month subscription £75 12 month subscription £144 Parrot Street tell us:" Our mission: to inspire kids to love reading. We know that reading for pleasure helps our kids develop imagination and creativity, along with a whole range of moral, intellectual, emotional and social skills. We know that reading fiction helps us understand others' and our own identities, building both empathy and confidence. But we also know that there are so many other things competing for our kids’ time and attention. So how do we encourage them to read more and to read more widely? Our goal is to introduce you and your child to books, authors and genres you may never have discovered. There are so many books out there, beyond the classics and the bestsellers, that we think you’ll love. And we are careful to choose books that aren’t pitched at any specific gender." Bookabees is a subscription book club for children. Each month they are sent books. Either you choose the books you want from the selection available on their website in a personalised package, or you let Bookabees make the choice. You can either keep them for 50% RRP of the book price or return them with no added cost to the subscription. You can send the books back in the packaging in which they arrived, although this meams the child will lose the activities they have done on the box. Personally, I would have trouble finding the packaging after two months, if my child had used it. The size of the packaging means a visit to the Post Office is necessary to drop the parcel off, although postage is paid for you. The 50% RRP cost is in addition to the monthly subscription, which is £4.99 a month for one book, £8.99 a month for three books or £10.99 a month for five books - a half price introductory subscription is available. Unfortunately, I can't easily view the full range of books available, as I do not have access to the subscriber area, so I cannot comment on the choice, but a range of books is displayed if you put in the child's gender (should we encourage this?) and age. From the books I can see, and which we received, Usborne Books feature heavily. We had three Usborne titles - Illustrated Tales of King Arthur, and two Young Readers. It's a nice touch that the books arrive in a personalised box, but unfortunately, our box arrived with brown packing tape over the child's name - Bookabees tell me this was not their doing and it must have been Royal Mail. Personalised activities to engage, inspire and entertain are included in the box, but I was disappointed to find they did not relate to the books, nor were all relevant to reading. There was a Christmas card to colour, a door handle hanger, stickers and a bookmark. Inside each book, a label is stuck in which shows how many children have previously read the book (if they complete it), and what they thought of it. Bookabees is an interesting concept, designed to encourage reading. Pack your suitcase and set off on an exciting journey around the world with subscription boxes from Geo Journey. You start off with an explorer kit with suitcase, travel journal, passport, map and activities - this is what were sent. A personalised letter to your child from Geo the owl and his best friend Atlas the puppy. The friends will join your child on a world adventure and every country pack includes a fact filled letter from them, telling your child all about their travels. The mini suitcase is beautifully made, strong and with a patterned fabric cover. The metal fastenings are good quality and this is the perfect way to store all the goodies that will arrive month by month. The world map is a good size and perfect to display on your child's bedroom wall so they can trace their journeys around the world; there's plenty of information on it too. The passport can be personalised for your child, and the travel journal has lots of space for sticking in the stickers and for your child to include their own information. Also included is a luggage label, photograph and fact card. First stop on the journey is the UK - Geo and Atlas come from York. 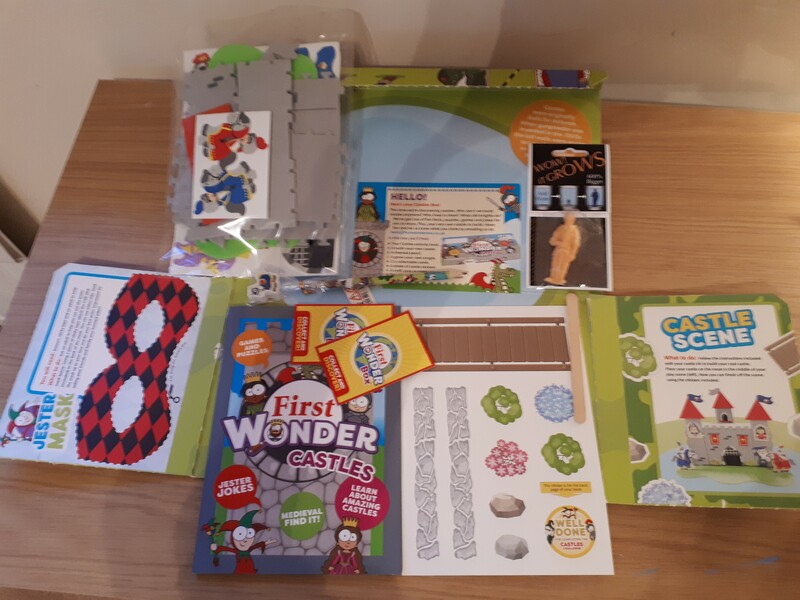 After the initial pack, you will receive exciting monthly packages through the post addressed to your child - please note that subscriptions can only be started in January, and there are 12 country packs, with the initial pack arriving beforehand. Each one is packed with creative fun and an exciting souvenir. Contents include a personalised fact filled letter, two photos, a fact postcard, a sheet of colourful stickers, an activity booklet, a travel ticket on a string and a souvenir such as a boomerang from Australia or clogs from Holland. The Geo Journey 12 Month Subscription single payment is £175.00, or pay monthly at £12 a month following a payment of £35 for the initial box. The boxes can be purchased individually for £14. All the contents are attractively designed, really well made and well thought out. This will make a lovely gift for a child, giving them year-round pleasure rather than a one-off gift. Children will really engage with the boxes, stimulating an interest in geography. Visit Geo Journey, find out more and set up your subscription. Inquisitive and questioning children will revel in the contents of these exciting boxes which will really stimulate an interest in science. We all know the importance of hands-on learning in science, and the home is the best place to provide this opportunity, where parents can enjoy sharing the fun of science with their children. These boxes make that meaningful and focused. The boxes are curated in Oxford, championed by scientists and explore a different topic each month. Each Curiosity Box is packed with hands-on activities and collectable lab kit to help children explore the world around them - and beyond. The topics are curriculum linked and are ideal for children between the ages of 6 and 11. Theboxes contain everything you need to carry out a range of experiments; by encouraging this, parents will be developing an interest in STEM subjects in both girls and boys. The experiments are great fun to do; although children will be able to do them by themselves, following the excellent instructions, they provide a good opportunity for family time together. Each experiment in the jumbo box was packaged separately, making them easy to use. Even younger children can have a part to play with adult supervision. We received the Microbeasts jumbo box. This included three full experiments - burping yeast race, disgusting dishes and make a microbe, as well as a molecular model of ammonia and an LED clip-on microscope. 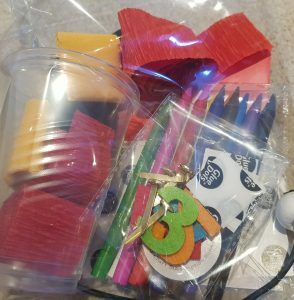 There is so much in each pack - below is the make a microbe pack, with everything necessary to complete the experiment, so no need to hunt around for that elusive (and annoying) extra piece. The packs have been really well thought out and the directions are simple to follow. There are three simple steps to subscribing. Starting at just £4.95, you can choose to go nano (fortnightly or monthly) or jumbo (monthly) - find out more here; buy just one box from the shop or click subscribe and save; then, Join the club to get access to support, videos, loyalty bonuses and more! These boxes are excellent - they support the curriculum perfectly and will be a brilliant resource for home educators. Other boxes include super seeds, weird water, cool crystals and amazing air. Children will love the experiments; I thought the ones in our box were really appealing to children, and they will eagerly anticipate the arrival of each box. The perfect way to give a long-lasting gift that is both educational and fun. Find out more and order your boxes at The Curiosity Box. Highly recommended and good value for money. The first thing that struck me with our box from Mila and Pheebs was how very pretty it all is. Wrapped in tissue paper, you are really drawn to investigate the contents of the box - and you won't be disappointed. Our box is themed Under the Sea. First up is the newsletter, which includes jokes, activities, facts, diary dates and more. Then we found two greetings cards and envelopes, both blank, one in pastel card and the other prettily embossed; a memo pad craft kit in soft foam with a foam octopus and stickers, an under the sea word search and criss cross, a lovely sand art adhesive picture with eight little pots of coloured sand, a blue whale eraser, a dolphin pencil and topper, a dotty art kit, a sheet of gorgeous sparkly stickers and a pack of foam stickers, and finally colouring sheets. Just imagine the joy on a child's face as they unpack this cornucopia. It is all really attractive and fits the theme perfectly. The boxes are recommended for 6+, and it's good that they fit through the letterbox, so no delivery problems. Such a lovely surprise for a child to come home to, and they will eagerly anticipate every box. There are four different plans available - Monthly Subscription £10.00 / month; Six Month £60.00 every 6 months; Monthly Sibling Subscription £18.00 / month and 3 Month Subscription £30.00 every 3 months. Individual boxes can be purchased at £10 each; these cover a wide range of topics and would be great for children with a special interest, and also good background to school projects. £2.99 postage is added at checkout and you cancel at any time with no cancellation fee. Subscribe now at Mila and Pheebs. Mila and Pheebs is a family-run company with a passion for all things stationery - remember the joy of new school stationery at the start of term? Now children can enjoy that every month with this exciting mix of stationery and craft. Children's creativity will be developed by these boxes, as will their knowledge of and interest in the themes. These are beautiful boxes - a huge amount of care has gone into sourcing top quality themed products to result in a box children will be thrilled to receive. History was my favourite subject at school and I would have been thrilled to receive these subscription boxes on a regular basis. Each month, a personally addressed time machine box is delivered to your home. Children will join Max and Katie as they travel back in history to solve a mystery in the illustrated adventure story and learn fun facts in the colourful history booklet. We received the Ancient Egypt Bumper Box, the first in the series, which includes a story; history booklet; word puzzles and other fun activities; themed bookmark; stickers; 3 colouring-in pages and crayons; a timeline sticker; specific to the first box is a world map and timeline (I love to see children using timelines, otherwise history can be a series of disconnected events to them); a craft inspired by history and a history-related gift (we had a super Egyptian lidded pot). They come in a sturdy cardboard box, perfect to store the contents for future use. The place to start is the welcome leaflet which goes through how to use the contents, step by step in a clear format that is easy for children to follow. The next step is to get creative and make a stunning craft, in this case, Egyptian amulets; our box included modelling clay, a generous set of eight paints, a paintbrush and jewel stickers. Then children can have fun solving the puzzles. The boxes are suitable for children age 7 - 11 and the topics are perfectly selected to support the KS2 curriculum. Children who are lucky enough to receive these boxes will have a head start, and increased enthusiasm and plenty of relevant materials. The website contains plenty of additional infprmation too - find out more about Ancient Egypt here. Other topics include Elizabethan Era, Evacuees in World War II, Ancient Greece, Wild West, Aztecs, Ancient Rome, Victorians, Vikings, Ancient China, Space and Stuarts. Whether your child is already a history fan, or you are trying to instill a love for history, these boxes with their varied activities are bound to stimulate enthusiasm. Set up your subscription now at Mysteries in Time. Choose the Classic at £7.95 + postage or the Bumper at £12.95 + postage (Worldwide shipping is available). Select 1, 3 or 6 monthly plan - the flexibility is really useful. Plans will automatically renew and you can cancel at anytime. A one-off gift option is also available. Mysteries in Time boxes make a perfect gift, one that children can enjoy year-round, giving lasting pleasure. The boxes are really varied in their composition and offer excellent value for money, with contents that are well made, totally relevant, and will give lasting interest. Highly recommended. This is an absolutely fantastic gift for any new mum. It really does contain everything a new born baby needs. I can really imagine the overwhelming joy that will come from receiving this box when expecting a baby and it is simply wonderful to unpack - so exciting. It all comes in the lovely box shown below, which can be used as baby's first bed, with the mattress and sheet that are included. Even if you already have a cot, the box would be ideal for use at a grandparent's house, or for a few days away. It will also make a super toy box and the design is perfect for a boy or a girl - as are all the contents of the box. 1 x Baby Box ; 1 x Mattress ; 1 x Machine Washable Breathable Mattress Cover ; 1 x 100% Cotton Fitted Sheet ; 2 x 100% Cotton Extra Large Muslin Swaddles (120cm x 120cm); 1 x Soft Toy ; 3 x 100% Cotton Baby Vests ; 2 x 100% Cotton Baby Sleep Suit ; 2 x 100% Cotton Hat ; 2 x 100% Cotton Bib ; 1 x 100% Cotton Luxury Blanket ; 1 x Baby Health & Grooming Kit ; 1 x 100% Cotton Luxury Bath Robe ; 1 x 100% Cotton Hooded Towel ; 1 x Burt’s Bees Baby Shampoo; ; x Burt’s Bees Baby Lotion; 1 x Burt’s Bees Nourishing Baby Oil; 1 x Burt’s Bees Diaper Ointment; 1 x Burt’s Bees Butter Milk Soap; 1 x Changing Pad; 2x Soothers ; 1 x Pack of Nappies ; 1 x Jar of Nappy Cream ; 1 x Pack of Water Wipes ; 1 x Bag of Cotton Squares. The health and grooming kits contains toothbrush, nail clippers, hairbrush, comb, nail files, nail scissors, digital thermometer and a nasal aspirator. All the items are top quality, with many well-known manufacturers featuring on the list. It's a really well thought-out selection, which addresses all those initial needs. There's nothing unnecessary; nothing here just for the sake of filling the box but everything is useful. 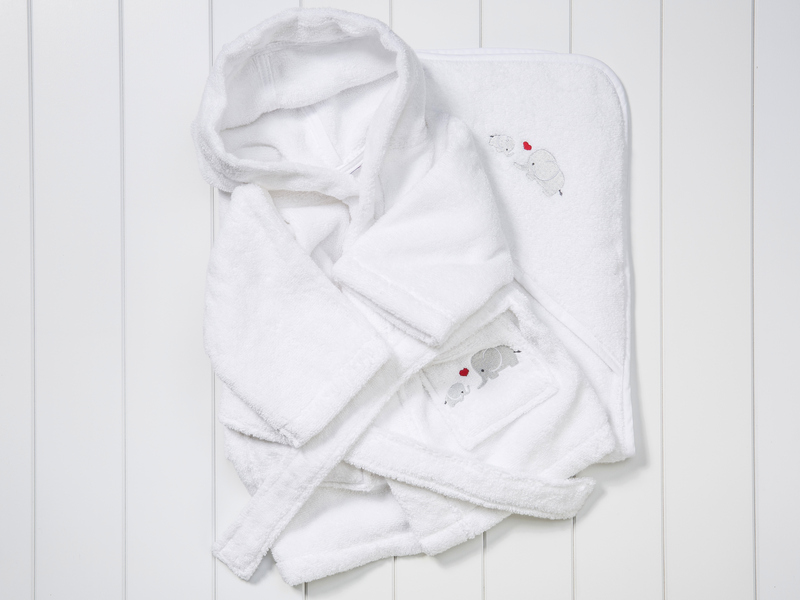 It's the little touches which make this so special, such as the lovely embroidery on the hooded bath robe. Everything is unisex, which is great. Where did the baby box originate? "In the 1930s, the infant mortality rate in Finland was one of the highest in Europe. In 1938, the Finnish Government implemented a series of initiatives to address the crisis. The cornerstone of this plan was the Finnish Maternity Package, commonly referred to as “The Baby Box”. The Baby Box was designed as a package of essential items required for the first 9 months of a child’s life – everything a child and their guardians would need to give them the best possible start. The Box itself was also designed to be the baby’s first crib, with a firm mattress, sturdy design and matching bed clothes. The simple, effective design of the box coupled with its firm mattress helps promote safe sleeping as recommended by the American Academy of Paediatrics, the National Institute of Child Health and Human Development and others. For almost 80 years, millions of Finnish Babies have taken their first naps within the safety of The Baby Box’s four walls. The programme is still going strong today and Finland’s Infant Mortality rate is now the 5th-lowest in the world." Buy a Baby Box and you are also helping those less fortunate. "Here at thebabybox.com, our goal is to promote safe sleeping for all infants and to bring the wonderful tradition of The Baby Box to families all around the World. We believe that all babies should be given an equal start in life regardless of where they are born. That is why we have partnered with UNICEF to distribute 10 Vaccination Kits to new-born children in the developing World for every Baby Box sold. Each of these kits contains 3 Vaccines – One for Polio, one for Tetanus and one for Measles. These vaccines ensure that children are protected against these three very dangerous and potentially fatal diseases." Visit The Baby Box for more information and to see their fantastic range of other products they provide. The Happy Book Club is a family run book club that encourages a love of reading in children. They have packages suited to everyone and all of them include two carefully considered, beautiful books, plus a creative activity sheet and a little gift. It's more than just a book club. Children will love to open the carefully wrapped parcel, and the big benefit of subscription boxes is that they are a gift that keeps on giving, with something new and exciting every month. We received the Tiger-themed package. The books sent are chosen to be age-appropriate from a selection, and they are all listed in the information sheet that comes with the pack. The theme is different every month - some past themes are Environment, Home, Discovery and Colour. It's a wide range which mean every mot=nth there's something quite different to look forward to. Along with the books is a pack of postcard-sized safari prints, lolly sticks and goggly eyes, along with a range of craft and activity suggestions, plus a mention of the current month's charity, Tiger Awareness. A charity donation is given for each box and this links to the theme of the box. The selections are carefully thought out and the extras do add value and increase interest. There are lots more ideas on The Happy Book Club Blog too. Subscriptions are flexible - you can opt for a one-off box (Halloween, Bedtime or Dinosaur themed, for example. Or you can buy subscriptions varying from one month at £15.99 to 12 months at £159.99. It's a lovely way to encourage children to really enjoy reading. The regular arrival of a package builds up anticipation and these are a perfect gift. Find out more and subscribe at The Happy Book Club. The first book is 'There's a Tiger in the Garden' by Lizzy Stewart. Nora's too old to play Grandma’s silly games- fancy saying there are dragonflies as big as birds and plants that swallow you whole. But even when Nora meets a grumpy polar bear, she is still convinced there couldn't be a tiger in the garden... just a minute, though - what's that? Imagination is a powerful thing, so when Grandma says she’s seen a tiger in the garden, maybe she could be right. Nora cleverly turns the tables at the end of the book, too. Observant children will spot all sorts of things in the garden, all wonderfully depicted in pictures that are full of texture and movement. 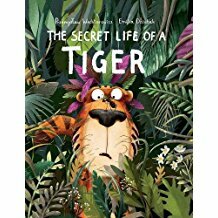 The second book is 'The Secret Life of a Tiger' by Przemyslaw Wechterowicz This book has wonderfully vibrant illustrations by Emilia Dzuibak which really capture the attention. Tiger tells his own story - he is a cat with simple pleasures, like chatting with friends and enjoying a little snack here and there. But he has a very different life at night and he hopes everyone will love him because of it. A charming, funny and warm-hearted picture book that reminds us that sometimes animals (and people) behave in unexpected ways. Abel and Cole offer a huge range of organic subscription boxes; their fruit and vegetable boxes are a cornerstone of their offerings. We were fortunate enough to be sent a medium fruit and veg box to try out. One of the key issues with subscription boxes is the quality of delivery, and this can't be faulted. The box even came wrapped in plastic, so it could be left safely, whatever the weather. I like the fact that the drivers won't knock before 8.30am, even if the delivery is much earlier - very thoughtful. The box is sturdy and Abel and Cole will collect next time and reuse. All the packaging used within the box is recyclable; packaging is only used when necessary, for instance, the tomatoes were in a container and the kale bagged. We received tomatoes, kale, onions, Nicola potatoes, carrots, chilli pepper, bananas, oranges and pears. All the produce was in perfect condition and, in the case of the pears and bananas, were just prior to perfect ripeness. All the produce is organic, so that means it is super tasty and you can rest assured you are not getting lots of chemicals with your 5 a day. Our first meal, which you can see here, was kale with spring rolls - very tasty. We also enjoyed a very tasty carrot soup, using carrots and onions from the box. Talking of which, having a regular delivery of fruit and veg like this is perfect for families, to help them reach that target. Food miles are also taken into account - and you can even opt for an all_British box. A practical booklet was included which gives useful tips (I learnt to keep carrots in water in the fridge), makes suggestions to ensure there's no waste, and explains the ranges available. Did they live up to their promises? Yes, in every respect. One of the best points is the flexibility of their offering - you can mix and match, omit selected items, skip a week. They offer recipe boxes, meat and fish boxes, groceries, fruit and veg boxes, meal kits and juicing & smoothie boxes - a really useful range. The quality is excellent and the variety of boxes, along with the flexibility, make for a really impressive offering - and it's such fun to receive a box, not know exactly what you are getting, and then to try out something different. Highly recommended. Take a look at the whole superb range and order your box at Abel and Cole. I was really pleased to find a copy of this super book accompanied my box. The theme is all you need to make stunning dishes everyday from the very best raw ingredients. It's a great way to get the best out of your boxes, as well as a handy book for everyday reference. The recipes are really varied, simple to execute, well explained and illustrated in full colour. It focuses on eating with the seasons and reducing food waste - issues which are close to the hearts of many people. Who knew that a celeriac could be made into the lightest fluffiest cous cous? Or that leafy carrot tops make a delicious herby dressing? And not forgetting sweet treats, watermelons make the most delicious thirst-quenching mojito ice-lollies, and dates and cinnamon are the perfect guilt-free combo in Spiced Gingerbread truffles. Really unusual ideas which make cooking fun for all the family. Toucan Boxes are a flexible subscription service delivering creative craft boxes to children aged 3-8. They have all sorts of benefits to offer your child - and every child is going to be thrilled to receive their very own, personally addressed, package to look forward to regularly. The boxes are inspired by Montessori learning and promote STEAM (STEM subjects are science, technology, engineering, and STEAM adds arts to these). Carefully thought out, each Toucan box is compiled by educational experts to help develop key skills. The boxes fit through the letterbox, and each one contains all you need to complete the projects. We were very fortunate to be sent two boxes for each of our young testers. The first box contains a royal crown and finger puppets. The crown is ready cut from yellow felt and there are 'jewels' and ribbon to embellish it. A pack of crayons is included to colour in the card finger puppets. The instruction book shows level of grown up assistance needed, messiness and drying time - really useful for quick reference. The instructions are very well presented with lots of pictures to help children work alone. There's much more in the booklet too, making it an excellent resource. There is information about kings and queens as well as plenty of puzzles and activities; I was really impressed by the added dimension and value this offers. The boxes have added value; one turns into a picture frame and the other can be used to create an aquarium - clever. The second box was Racing Jellyfish. Again, a very useful booklet plus all you need to make and decorate the jellyfish, even extending to including hooks to hang them up. My two young testers (4 and 6) were totally engrossed for several hours - I was thrilled by the way the boxes captured their attention. The 6 year old just went ahead completely independently, and created some super results, really utilising his creative skills. The four year old needed a little help but there was plenty she could do on her own. Once the crafts are created, there are lots of opportunities for role play and imaginative games, giving the boxes lasting value. A really well thought-out box which I highly recommend. Toucan say: As much as we want children to have fun, to be carefree and happy, we also want them to develop into curious and critical thinking people, to open their minds to new ideas, and have outlets with which to express themselves. ToucanBox is built to be such an outlet, with every process, project, and policy designed to support a philosophy of empowerment, both intellectual and emotional, for children and for parents. There are three different boxes. Petite boxes contain one project and can be shipped on a fortnightly or monthly basis. Grande boxes contain two themed projects and are shipped once a month. Super boxes contain four themed projects, and are also delivered once a month. Grande and Super boxes also come with a terrific book that compliments the theme of the activities. Find out all you need to know on the Toucan Box website. We love Toucan boxes so much we have subscribed. We were really excited about our Deluxe box from Love with Food. The bright red box was full of an eclectic selection of foods, few familiar but mostly completely new to us. Altogether, there were an amazing 17 items; a few of these were individual sweets and biscuits but there are plenty of full size packs included. The wide variety means there will be several things for each member of the family, making this a box that everyone will eagerly anticipate. There's a good mix of savoury and sweet and the snacks are all healthy too, making many of the items suitable for school lunch boxes. Love With Food proudly claim no artificial flavoring, colouring, or MSG; no trans fats and hydrogenated oils; no high fructose corn syrup and all packs are natural, organic or gluten-free. We enjoyed two packs of cheese flavour Pop Corners - new to me and very crunchy and tasty. Harvest Snaps Snapea Crisps are also unusual - flavoursome and a healthy snack. 3 packs of fruit rolls were also included - again, tasty and healthy. The instant porridge pot was perfect for busy cold mornings. The children loved the mixed Berry Fruit Snacks and the blueberry Fruit Stixs. My favourite was the Brownie Brittle. We also enjoyed a selection of granola bars, licorice and popcorn. Every one of them made with healthy ingredients. Love With Food is the easiest way to Snack Smart and Do Good. When you take out a subscription with Love with Food, not only will you find you have an exciting box delivered monthly, containing a fascinating selection of organic, all-natural or gluten-free snacks, but you will also be helping to fight childhood hunger in the US and around the world. Receive a box of mystery better-for-you snacks and go on a fun foodie adventure every month. Membership starts from as little as $7.99/month; the deluxe box is $16.50 (check current exchange rates). We loved the opportunity to try out some unfamiliar foods and getting a box like this really encourages you to try new tastes. The contents are really varied, a great mix for all the family - and you can bask in the glow of knowing you are helping those less fortunate too. Sign up for your subscription at Love with Food and enjoy tasty healthy snacks every month. Just to explain - this is a little different from my normal reviews as unfortunately, Thyme discontinued the box I was sent almost immediately, so I have been unable to review a current offering. We were thrilled to receive a super box from Thyme, (pictured below - the individual items will be available in other selections) which was an excellent assortment from across their range. First things first - it arrived well packaged and was left in the porch, as requested. There's no need to be at home - you just state a safe place for delivery. When I opened the box, I found the ice packs were still partially frozen, and thanks to the rockwool packaging, everything was still really cold. All packaging can be recycled. The food is all well packaged, with clear cooking instructions on every packet and generous expiry dates. Our mixed box was an excellent introduction to the range, with a wide variety which really showcases Thyme well - such a shame it is no longer available. Of course, the superb quality will remain unchanged and Thyme do offer a wide range of boxes and the flexibility to customise your own is a real plus. Boxes include Build Your Own Meal Taster Box, Stews and Casseroles, Smoothies and Vegetarian. Take a look at their website for the whole range. We really enjoyed their lamb burgers, which were meaty and tasty, and we accompanied them with some (fairly) healthy sweet potato chips which were delicious. Next up was the Traditional Beef Stew with Dumplings. This is cooked in chocolate stout and was really rich and unctuous - the delicious smell lingered for ages! The single portion Fish Pie and Macaroni Cheese were delicious and perfectly sized, plenty generous enough to be really satisfying. Thyme say "Our mission is to make it easier for your family to eat better. All our food is prepared fresh, exactly like you would at home, if only you had the time. Then we freeze it. We freeze for freshness and convenience, nothing else. There’s no need for nasty preservatives and it’s ready when you are. And to make life even easier we deliver your order directly to your door in its very own thyme capsule; mini portable freezers that keep your food frozen for up to 24 hours, so you don’t need to worry about anything defrosting. Our friendly couriers will happily leave with a neighbour or in a safe place – just let us know." Delicious meals, a great range, plenty of flexibility (a really significant part of Thyme's offering), efficient delivery, effective packaging - Thyme offer everything we need from a subscription food service. Find out more and order your box from the Thyme website. Everdine pride themselves on producing clean and wholesome gourmet meals, which are developed by chefs trained in Michelin-starred restaurants - so you really are getting restaurant-standard food prepared right in your own kitchen. The meals come ready cooked and frozen, and Everdine recommend that the majority of their meals are reheated in the microwave, from frozen; most only take around 10 minutes to heat, so you can be sitting down to a flavoursome meal in a very short time. The meals are delivered by courier, and if you are not going to be home, the box can be left in a safe place. The food was excellently packed, with wool packs around the food and frozen gel packs ensuring it arrived really cold. It's great to know all the packaging can be recycled (the wool is great for lining trenches for growing runner beans!). All Everdine meats and fish are sustainably sourced and they use only the best ingredients from suppliers they know well and who meet their strict quality standards; this all means that the quality will remain consistent. Being frozen means there is no waste and no rush to eat up the meals - they are all dated and the dates were well ahead; freezing locks in all the natural goodness with no need for artificial preservatives. You can choose from Classic or Veggie boxes, and either 8 or 12 meals (they are single portion, which is great to accommodate different tastes in a family). Deliveries are made on Fridays and Saturdays, and what really sets these meals apart is that you can choose from 1, 2, 3 or 4 weekly schedules, so no worrying about remembering to cancel a delivery, or getting too much food to cope with. There are lots of different meals to choose from, and you can make up your own selection. We received a classic 8 meal box which included slow cooked beef and vegetable bourguignon, shitake and tofu teriyaki, roast duck breast and blueberries, rainbow vegetable pad thai, parsnip and paneer curry, Mediterranean cod, lentil and quinoa moussaka, and courgette and feta quinoa cakes; as you can see, a great variety of tastes and textures and there are plenty of vegetables included with each meal to help you towards your five-a-day. Your box includes a list of the meals included. Each one of the meals was very tasty - my personal favourite was the cod, and my husband very much enjoyed the duck. The meals were definitely out of the ordinary, and not what I would normally cook - I really enjoyed the opportunity to try out new foods and flavours. The meals all looked very appetising and colourful, both before heating and once served - you can see some of our meals alongside. The labelling was clear and all the ingredients listed. We really enjoyed these meals and especially the convenience of individual frozen meals - it was like having our own restaurant menu as we choose what to eat each night. Everdine have generously offered a special discount code for our readers. By using IN1PARENTSINTOUCH at the checkout, you will get £20.20 off your first box which means you can get 8 meals for £35 - great value. Find out all you need to know on the Everdine website. I was delighted to be asked to review recipe boxes from Mindful Chef. I am a big fan of the idea of recipe boxes, and they are a real boon for busy families. No spending ages in the supermarket, picking up lots of different ingredients - and no starting to cook and finding you haven't got something essential. Mindful Chef deliver to your door, and the box will be left in your designated safe place if necessary. The packaging is designed to keep the food cool for up to 48 hours and certainly our meat and fish, carefully wrapped in wool packaging with ice packs, was cold when I opened the box. They deliver on Sunday afternoons within the M25 and Mondays nationwide - delivery is free. Mindful Chef are a health-focused food box company and since their launch in 2015, they’ve shipped over 500,000 healthy recipes from small farms in Devon. Their approach is very simple, yet incredibly effective in helping you lead a healthier life; believe in reducing your intake of sugar and refined carbs. As a result, we never deliver pasta, bread or white rice - instead all our recipes are based on innovative uses of fresh vegetables. Each week, there are eight different recipes to choose from and four of these will be vegan. It's a great way to kickstart healthy eating and a good way to introduce a new way of eating to the family. The vegetable and other ingredients for each recipe come separately packed in a brown paper bag, so you have all the ingredients readily to hand. Obviously, it is best to take the vegetables out and refrigerate them until needed; most things are separately labelled but I did find the print a little small and faint on some of the packets. Once you are ready to cook, each recipe comes with an illustrated card which lists all the ingredients plus step-by-step instructions. These are clear and generally easy to follow and I like the fact you are also building up a recipe library. The only extras needed were oil and salt and pepper. I love all the little packs of ingredients and it's so convenient. The fact there is no waste makes the meals good value for money. Mindful Chef are unusual in that they do meals for one. Our first meal was the Aubergine, Courgette and Beef Lasagne. I am not a great fan of pasta, so I really like the idea of using sliced vegetables to layer the meat. The aubergine was roasted and the courgette was used raw - i wondered how this would work, but it gave an added crunchy texture which was really good. The portions were generously sized and would certainly satisfy anyone with a good appetite. The quality of all the food is very obvious from the excellent flavours - most produce is from British farms, which is good to know. Second, we cooked Shanghai-style Pork with Crispy Cabbage. The portion sizes with this one were even more generous - in fact, we fed three people quite happily with a two-person meal. It came with shiitake mushrooms, rather than ordinary ones, and these gave the finished dish a real depth of flavour. Again, the instructions were clear and easy to follow and the finished dish came out just as expected. Teriyaki Salmon, Crispy Kale and Choi Sum was another big hit. I don't like spicy food, but it was easy to adapt the recipe so we only used the chilli for those who wanted it. There was plenty of salmon, and it came ready packed in four separate packs, so easy to use. All the ingredients were ready weighed out and neatly packaged - I love having all the little pots and packs, they really make cooking fun. I am sure that the convenience will wow most people and it's a great alternative to ready-prepared meals; an excellent way to involve children with cooking too - and to help them learn about the provenance of their food. We also tested Lamb Souvlaki with Greek-Style Salad and Pork and Apricot Meatballs with Spiced Quinoa. Again, the recipes were easy to follow, the ingredients were first-rate and the finished dishes really enjoyable. I have to confess that most of these dishes took me out of my comfort zone, but that can only be a good thing, and it has really encouraged me to make more of an effort to widen my repertoire - we don't need to eat refined carbs to enjoy our food. Want to try Mindful Chef for yourself? We have generously been offered a discount code which gives 25% off your first box (to new users only). The code is PARENT25 and this link automatically applies it: https://www.mindfulchef.com/?voucher_code=PARENT25. I highly recommend that you take advantage of this offer and enjoy Mindful Chef's meals for yourself. There are new recipes every week, so you are bound to find meals to your taste. I am always keen to incorporate more fruit and vegetables into our family's daily diet, and the arrival of a box of 11 assorted fruit and vegetables really helped me in this aim. I was sent the Large Fruit and Vegetable box. The selection included tomatoes on the vine, courgettes, bunched carrots, celery, bananas, real spinach, Valor potatoes, onions, oranges, pears and broad beans. If you don't want so many root vegetables, you can opt for the Les Roots box. The spinach was delicious - it's not the ubiquitous perpetual spinach but true spinach which doesn't leave that nasty dry feeling in your mouth. The potatoes come packed in a brown paper bag, which means they store well; they were very tasty and held their shape well. I normally avoid large tomatoes, but these were full of flavour and worked well both in salads and roasted. Lots of broad beans were included and, although always time-consuming, these were much nicer when double-podded. I learnt something too - boiling them before double-podding is much easier. The box included a recipe for Broad Bean Bruschetta - we didn't try this but I like the fact that the slightly less common vegetables came with a recipe suggestion. Also in the box was a very useful booklet describing all the vegetables commonly found in Riverford boxes. We are not huge fans of cooked celery, so we used the celery as a dipper and in salads, although I suspect it would be better cooked. I am always wary about pears; these arrived very hard but after a week were beautifully soft and juicy - best I've had in ages. The oranges too were beautifully juicy. The small bananas were ideal for the children. Onions, potatoes and carrots were my root veg. The potatoes were nicely bagged to keep well; the carrots came with tops (and useful advice to remove the tops on receipt) and the small white onions were a convenient size. The courgettes were tasty, especially when spiralised. There was a very useful booklet included which explains all about the vegetables, when they are in season and their place of origin. I found this useful in giving general guidance on where the vegetables were grown, although I would like to have known this for each individual item. Overall, I am really impressed with the quality and presentation of the fruit and vegetables. The delivery was efficient and friendly, and the box is returnable, being usable up to 10 times. The box represents good value for money, too. There are many more options on the Riverford website, including meat, fruit and salad and recipe boxes. The final box below is a sample. I was delighted to be given the opportunity to review a Family Box from HelloFresh. It is a brand I have been interested in for a while so it was great to receive a box. The first part of my review concentrates on the delivery and packaging, as this is such an important part of these services. Firstly - there is no need to be at home, as the delivery will be left in your specified safe place. Delivery dates can be chosen when you select your box. For anyone worried about food safety, there is no concern at all. The box arrived feeling very cool, and the fresh products, including meats, are all packed in a separate bag with insulated packaging and frozen ice packs - the food was cooler that food brought home from the supermarket. It's also easy to pick out which food needs refrigerating straight away - a boon for busy families when they arrive home with 101 things to do. I was impressed that the insulated packaging is compostable too - we plan to put it in the runner bean trench! The remainder of the meals come in their own separate packs, so there's no wondering what goes with which meal. Everything is separately packaged where necessary, but not wastefully eg the vegetables are loose. You will find everything you need, barring a few very basic store cupboard ingredients eg olive oil, and in the right quantities too so there is no waste. I love the fact that everything is all together - there's nothing more frustrating than getting to the end of a busy day, starting to prepare a meal, and finding an essential ingredient is missing. I tried the oven-baked mushroom and bacon risotto first. The packs come with a recipe card for each meal. The instructions are clear and very easy to follow - it even tells you the cooking utensils you will need. There are step-by-step photos too. The good thing here is that you can keep the recipe cards so you can re-create your favourite meals. The perishable food is dated and all had at least 7 days from receipt; it is also securely packed so ideal to put straight into the freezer if you don't want to cook the meals soon. The packs even tell you where the food comes from and it's all high quality. I love the individual packages for instance the 30gm butter pats, all labelled with the producer. and place of origin The portions were very generous and the meal really tasty, although we found the honey dressing for the mixed leaves too sweet for our taste. The spaghetti pomodoro with melt-in-the-middle meatballs was another winner. I always have problems getting meatballs to actually stay as meatballs rather than landing up as mince, but the ingredients must be balanced just right as even with the yummy mozzarella filling, the meatballs stayed intact. The recipe says 40 minutes preparation time, and that was quite generous. Again, the recipe was easy to follow and I like the fact that the recipe cards are attractive to keep and will definitely encourage me to try the recipe again - although I much prefer to have all the ingredients ready to hand from HelloFresh!, The meal was really tasty and the portions are very generous - the family box is designed for 2 adults and 2 children, but there is plenty for 4 hungry adults. The third meal I cooked was Spiced Pork with Creamy Lentils and Nigella Chapatis. The outstanding part of this to me was the creamy lentils - lentils cooked with spices, vegetables and creme fraiche, which was really tasty and a definite addition to my repertoire. Again, the portions were generous and the quality excellent. I did find frying the chapatis a little tedious though - eight of them at a minute each. However, the end result was well worthwhile, as it was an unusual and very tasty meal. The pork was tender and flavoursome and went perfectly with the accompaniments, making a well-balanced meal. Our final meal was the Chicken Breasts in Buttery Garlic Sauce. So often, chicken breasts can be tasteless but once again, the quality was first-rate and the chicken really flavoursome - and very generously sized, too; we were so impressed with all the portion sizes, making the meals really good value. This was probably the quickest of the meals to prepare, and the roasted potato and carrot with thyme really tasty. I must confess to having used the broccoli which was part of the meal, earlier in the week, and I cooked the first of the new season asparagus with this, which was simply perfect. That's a bonus of the meals - you can add your own variations if required. I am definitely hooked on HelloFresh meals and will be a regular from now on. It is great because it made me cook from scratch - with the accompanying satisfaction - without hours trawling around the supermarket. I love the way every item is pre-weighed and so well packaged too. Every meal was absolutely delicious and the portion size really good. The website is easy to use, too, and you can choose from a Classic, Veggie or Family Box with great choices within those. HelloFresh meals are a good way to take yourself outside your comfort zone, trying recipes you may not have done otherwise and thereby increasing your repertoire. Miniscoff make a range of award-winning organic frozen meals for children. They are 100% organic and are carefully hand prepared by their own chefs in Wiltshire. This way we can be sure you are getting the very best. They only use “ingredients that are 100% organic (and local where possible), ensuring the highest standards for taste and nutrition, the animals and the planet. No GM or artificial stuff is tolerated, our meat is from organic, British farms and all our meals have sensible levels of salt, sugar and fat (appropriate for a one year old). By naturally quick-freezing our meals everything is kept as fresh as the day it was made, ready for when you need it.” These are ‘proper’ meals, just like you would cook at home, and they are a real boon for busy parents. There are many times when having a delicious and nutritional meal ready in 10 – 12 minutes (microwave) or 30 to 40 minutes (conventional oven) is just what you need. Miniscoff home-deliver themselves, and you can choose from three meal packs to order direct from Scoff Central, selecting 6, 12 or 30 meal packs with your own choice from across the range. Deliveries can be made Tuesday to Friday between 8am and 12pm. Minoscoff do require that someone is available to sign for the delivery, so they will contact you to arrange a convenient time. The meals are also available through Ocado. The first thing parents will want to know is how well packed the food is, and whether it will really stay frozen. Well, the answer to that is a resounding ‘yes’. Deliveries only take place between 8am and noon, so you know the package hasn’t been languishing around for too long. The food arrived in a sturdy polystyrene box, surrounded by ice packs which were still completely frozen when I opened the box - you can see this in my photos. We received a super selection which incorporates meals that are all well-tried children’s favourites. All the meals are suitable from 1 to 8+ years, and give 1 to 2 servings, depending on your child’s age and appetite. I added additional vegetables to one of the meals and then a pack fed a 3 for two meals. Here’s what we got: ali baba's shepherd's pie is a yummy, succulent take on a traditional shepherd’s pie with organic British lamb & some hearty mash. curly wurly chicken is a scrummy Bolognese made with organic chicken in a rich tomato sauce with basil, served with very child-friendly curly pasta - you can see from my tester's face how much she enjoyed this. broccoli bill's pasta pie is a tasty vegetarian pasta dish with a tomato & mushroom ragu, broccoli florets and a creamy cheese sauce. ; my young testers are not vegetarian, but they thoroughly enjoyed this one; broccoli is often popular with children, so it’s a good choice. salmon ocean pie is made with organically farmed Scottish salmon fillet in a creamy sauce with vegetables and mashed potato. I couldn’t resist trying this one myself – all in the interests of reviewing, of course! It made a good lunch, with plenty of flavour; there’s a danger that food prepared especially for children can be bland, but this certainly wasn’t. I can’t say that my presentation was as attractive as this, but it shows what can be done! planet spaghetti is organic pork & beef meatballs orbiting in a spaghetti galaxy & a rich tomato sauce. Miniscoff say this is the fastest selling meal on the menu, and when I offered my testers a choice of meals, this was their first choice. chilli yum yum is a mild chilli to tickle the tastebuds, sweetened with mango chutney and served with basmati rice; the evidence of enjoyment is clearly seen below! Brilliant to see a really tasty meal offered to children and this one was another hit, really enjoyed by the older child. Also available are ali baba’s shepherd’s pie, jolly spag bolly and creamy salmon pasta. Minoscoff also produce a range of organic sauces - chicken and bacon sauce, bolognese sauce, West Country cheddar sauce and cheese and tomato sauce; these are currently only available through Ocado. It’s excellent that the packs come with allergans clearly listed, as you can see in the image of broccoli bill’s pie. You can see nutritional information on the website, which lists ingredients, allergy advice and nutritional information. It’s so much easier to assimilate all this information in the peace of your own home than trying to absorb it in the middle of a busy supermarket. If you care about the food you give your children, then Miniscoff meals are definitely for you. They are truly excellent and most adults would be only too pleased to enjoy them along with their children. I recommend that you try them at Miniscoff. Martin and John started Good Taste Foods in 1998 with the aim to supply and deliver quality frozen food that tastes as good as fresh. Good Taste Foods have now supplied 40,000 customers offering a convenient, personalised and reliable delivery service of specially selected quality frozen foods straight to your door. I was delighted to be asked to review a selection from their range. Perfect for busy families, the products are delivered to your door, with no delivery cost, and in packaging that keeps the food frozen for 24 hours. You don't even have to be in to accept delivery - just specify a safe place and your food will be waiting for you when you get home - our delivery came within the promised time slot. Good Taste products are packed in large clear plastic bags, which you can use to store the food in your freezer - the bags are sturdy and each item separately packaged so it's easy to take out just what you want. Storage and cooking instructions are on the packs - many products can be cooked straight from the freezer - perfect for busy people. Both the Good Taste boxes and plastic bags can be fully recycled. My food arrived in excellent condition, with dry ice packs around the food and the whole packed into a well sealed polystyrene box.Even though it was the end of the day, there was no suggestion of thawing; the food was deeply frozen. We received packs of chicken en croute. First - they are well packed, in sturdy plastic bags, and labelled, ready to go straight into the freezer. The cooking instructions are clear, as they are for every item and were spot-on for timing. the products were very tasty, with crispy pastry and plenty of filling; the chicken was soft and tender and the whole meal was generously sized and very satisfying. They have though of everything - the croutes are even ready-glazed! The salmon steaks were neatly individually packed as this made them really easy to use. So often, with a larger bag, you get some freezer burn once you start a pack, so this individual packaging is really good. The portion size is just right and the salmon was moist and tasty. The cod was also well packaged and easy to use. The duck leg confit was, I am told, quite delicious. The portions were generous and it was oh-so-easy to cook. Both this, and the pulled pork were packed in stout plastic bags that will withstand a bit of rough treatment in the freezer - always a concern with a chest freezer. The pulled pork was rich and tasty, very well flavoured but not overpowering. These are excellent products to buy ready prepared as they take a great deal of time to cook from scratch. The left-over pulled pork was delicious in rolls and would be great for summer barbecues. The products are not cheap, but you really do get what you pay for. Quick service, an easy-to-use website, excellent packaging and very tasty products that will save busy parents lots of time. The website showcases a fantastic range of products - there is plenty here for every family, including a good vegetarian range. There are also desserts - sadly, I haven't tried these, but if they are up to the standard of the food we enjoyed, then they will be well worth a try. A one-stop shop for all aspects of education. Reviews of child-related products and books.